Petru Fudduni, as he preferred being called, was born Pietro Fullone in Palermo and was very popular during his lifetime. Although his date of birth is unknown we know that he died on March 22, 1670. He is mentioned by Giuseppe Cucchiara in Folklore Italiano, and by Giuseppe Pitrè in volume 3 of the Biblioteca Siciliana. A list of his works is also found in Mira's Dizionario Bibliografico Siciliano. These examples were taken from "Petru Fudduni: Puisì e Cuntrasti in Sicilianu", Illustrazioni di Mario Viola, Reprint s.a.s., 86 pp., Palermo. The word "fudduni" has a number of meanings. It can refer to the footprint that beasts of burden leave, or used as "granciu fudduni" it means a mistake, or it can mean to rush along without consideration of others. According to Piccitto it can also mean a pit or a hole: narrow, mean or petty; a pigsty; a round skin lesion from an allergy to fave; or a crab. 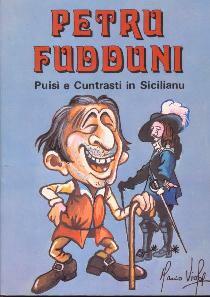 Beyond national pride, I suspect that Petru Fudduni enjoyed the whimsy associated with the various meanings of the Sicilian version of his name. di vidiri Fudduni tuttu sfardatizzu. Si mi viditi sti robbi sfardati? to see Fudduni in torn clothing. What marvels when at last you find what truly matters.